New Delhi: An “electronic nose" to detect tuberculosis, a new blood-stage malaria vaccine, and using ultrasound to determine the nature of infection of the mosquito-borne disease are among the projects that received grants from the Gates Foundation. On Tuesday, the Bill and Melinda Gates Foundation awarded 76 grants of $100,000 (Rs46.4 lakh) each to public health researchers around the world. These were made in round three of the foundation’s $100 million Grand Challenges in Global Health initiative, which has awarded grants to at least 100 researchers from 22 countries, including India. The initiative offers funding for innovative research that has the potential to lead to breakthroughs in addressing health problems faced by the developing world. Open to anyone from any discipline, the grant application has low entry barriers, requiring no preliminary data and consisting of a short two-page form to be filled online. The Grand Challenges initiative will hopefully produce a breakthrough idea that could save millions of lives, says Tachi Yamada, president of the Gates Foundation’s global health programme. Of the 76 grants awarded, three went to research teams from India. Seed money: Deepak Gaur’s team has been awarded a Gates Foundation grant to develop a blood-stage malaria vaccine that uses a combination of two proteins found among a wide diversity of malaria parasites. Early detection of TB, a disease that causes 3 million deaths every year, is thought to greatly reduce the risk of mortality. The ICGEB team’s first round of research will focus on validating its hypothesis that a TB patient’s breath contains molecules that are different to those of a healthy individual. If this is successfully established, the team will focus on detecting and depicting this information through a hand-held, easy-to-use gadget. The device, dubbed the “electronic nose", will have layers of absorbent material that can differentiate between various chemical molecules. “We will depict that variation between different molecules hopefully through an electronic signal," says Chauhan, who is also the director of ICGEB. Chauhan has worked with another team from ICGEB, comprising Deepak Gaur and Chetan Chitnis, which has been awarded a Gates Foundation grant to develop a blood-stage malaria vaccine that uses a combination of two proteins found among a wide diversity of malaria parasites. Their goal is to stimulate antibodies that would stop red blood cells from being infected by parasites by blocking multiple pathways of invasion. To date, all existing blood-stage malaria vaccines have been based on one antigen. 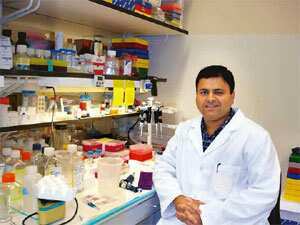 Gaur, who has been conducting malaria research for eight years, explains that the malaria parasite has developed several alternative routes of invading red blood cells and is hence able to evade drugs directed against a single molecule. The team’s research focuses on developing a vaccine that uses a combination of three antigens in an attempt to block the parasite from invading a person’s red blood cells. According to Gaur, no published work on this topic exists so far. “The grant has been awarded for us to develop a new type of vaccine that has never been tested before," he says. He explains that the $100,000 is essentially seed money to test the hypothesis over a period of one to one-and-a-half years, after which the assumption is the applicants will generate sufficient data to apply for a $1 million grant to develop and deliver the concept. Abani Nag and Amiya Hati of the Calcutta-based Vivekananda International Health Centre in India have been awarded a grant to test the hypothesis that ultrasound measurements of the liver and spleen, as well as functional liver enzyme tests, will help differentiate between cases of malaria relapse and re-infection, leading to more appropriate treatment and drug therapies. Nag and Hati discovered during ultrasound investigations that the liver and spleen of malaria patients who turned out to be suffering from a relapse were more enlarged that that of those who had a fresh infection. Over the next year, the team plans to test 1,200 patients to see if they can establish statistically significant data that will allow them to use liver enlargement as a test. “Except for detection by biopsy, which is a very invasive procedure, no other procedure to detect the difference between a relapse and re-infection has been conducted," says Nag. “This is the first time such a study is being undertaken anywhere in world." Malaria infects about 500 million people every year and kills about 2 million. This is not the first time Indian researchers won Gates Grand Challenges Grants. Last year, Nikita Malavia, a chemical engineer from Mumbai, who is also a professor at Massachusetts Institute of Technology, was funded for attempting to engineer nanoparticles whose outer surface mimics the cell membrane, inducing viruses to attack the nanoparticles instead of human cells. Karthikeyan Kandavelou, a project leader at Pondicherry Biotech Pvt. Ltd in Puducherry was also given a grant for research into genetic approaches to fighting HIV/AIDS, by attempting to mimic the natural resistance to HIV found in some people.